At a glimpse: Discusses the economics of the Tree Collar. As tree growers, we found our profitability depends on our resourcefulness and ability to recognize areas where we can substantially reduce costs. Many times these costs are hidden and, until someone makes us aware of them, we continue to do things the way we always have. 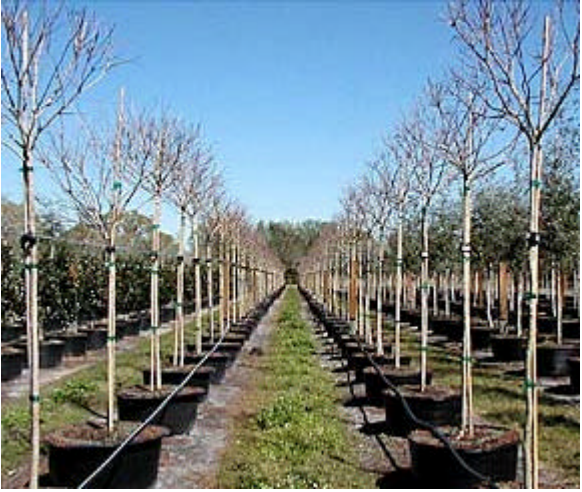 At Sun City Tree Farm in Ruskin, Fla., we’re constantly evaluating ways to save money without sacrificing the high quality of our crops. Over the years we found one element was costing us too much money – the wind. As container growers, we are keenly aware that every time the wind comes up many of our containers end up on their sides. Wind blow-over was hurting us. Whenever we had containers on their sides we had additional labor costs and broken branches that often made a number of trees unsaleable. Expensive, slow-release fertilizer was on the ground rather then in the containers and reapplication became necessary. We needed a better system for securing our trees and, after much trial and error; we ultimately decided to use a post-and-cable system. This system was easy to install and the components are inexpensive, readily available and last for years. And the best part was that the cost of protecting our trees became negligible. It now cost us just $1.32 per year to protect a 45-gallon tree (based on the system having a 5-year life) when prior to installing the system we were spending about $11.00 per tree per year. Once we had the post-and-cable system in place we had to figure out the best way to attach the trees to it. There were a few devices commonly available for securing the trunks to the cable, but were unacceptable to us for various reasons. They didn’t expand as trunks grew, scared trunks, were difficult to remove, didn’t last long or had to be frequently replaced. Out of frustration we wound up designing and patenting our High Caliper Tree Collar. It’s secured easily to both the tree and the cable, is weatherproof, lasts for years, can be expanded as the trees grow and can easily be detached from the trees as well as the cable. We tested various materials and found heavy-duty polypropylene webbing was strong enough to hold the trees. An inner rubber pad was added that is soft enough to protect the trunks. We also incorporated industrial –quality Velcro and latch closures to secure the collar around the tree’s trunk and make opening and closing easy. Cable. We use -inch cable (or 3/16” inch). We tried other sizes, but lighter cable did not hold the trees and heavier was overkill. We run the cable on 400-foot rows, so we get 420 feet of cable per row, giving us 10 feet of cable to anchor on each end. The 400-foot rows are short enough for us to keep good pressure in our irrigation lines, yet long enough to work a good number of plants. Posts. They’re installed with an auger, and no concrete is used. We use 4-by-6- inch posts, 10 feet long (or 8 feet long on the 25- gallon rows). Posts are buried 4 feet into the ground. We place a post every 50 yards. We place a thin L-shaped strip of sheet metal on top of the post and hold the cable in place there with a 2 -inch U-shaped fencing nail. Set the cable on the post before hammering in the U-shaped nail. Ground anchors. These are important. We use the same type of ground anchors that commonly anchor mobile homes. They’re 4 feet long by 8 inches. Turnbuckles. Set in the middle of the cable line is the turnbuckle. It’s the least expensive component of the system, but one of the most important. The turnbuckle allows you to tighten the slack on the cable when it is installed. The cable can then be tightened or loosened as needed throughout the year. Tree Collars. These hold each tree in place on the cable. The tree collars attach to the cable with a stainless steel clamp. Once the tree collar is in place, it creates a permanent holding station for the plant. The tree collars are available from High Caliper Growing Systems in Oklahoma City. The tree collars are quick and easy to open and adjust, but will not accidentally open. We set the collar on the tree with about a 1/8-inch space of wiggle room. As trees grow, the collars need to be occasionally loosened. This is quickly done with the adjustable Velcro and latch. At our farm, we loosen the collars about twice a year. 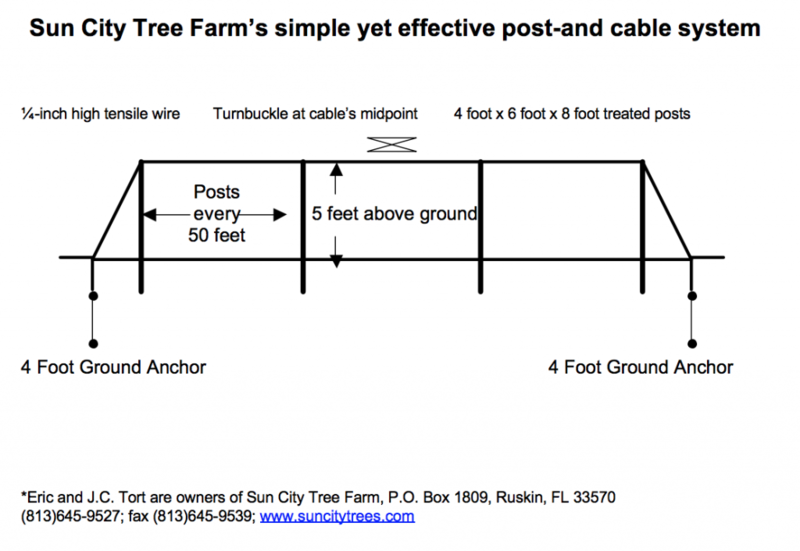 One big advantage of the post-and-cable system with the tree collars is that trees can be quickly and easily laid down in the event of bad weather. When a hurricane or tropical storm is forecast, we can lay down 50,000 trees in a matter of hours. The tree collar allows us to be quick. After the hurricane, we can pick the trees up and reinstall them on the cable within a few days. Last year, Florida had four hurricanes and we laid down parts of our nursery four times. The post-and-cable system paid for itself in just one laydown. 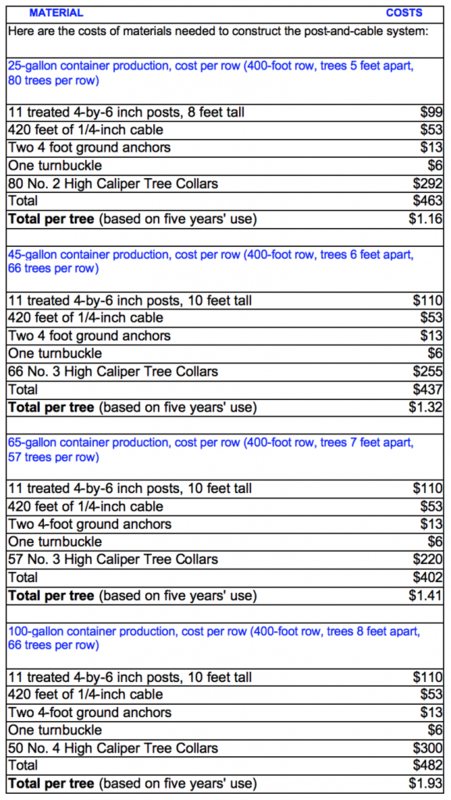 We calculated that the system runs about $1.16 per tree for 25-gallon trees (based on five years of use). 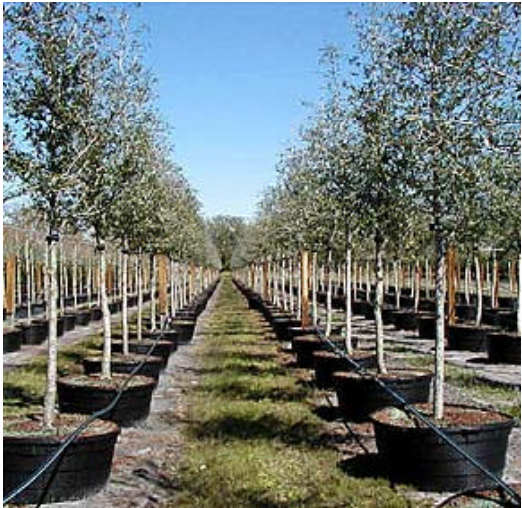 It runs $1.32 per tree for 45-gallon trees, $1.41 per tree for 65-gallon trees and $1.93 for 100-gallon trees. These cost are quite negligible since we’ve found that this system lasts for at least five years. Parts of the system last longer than that. On the other hand growers are faced with some real or hidden costs if they do nothing or don’t install some type of system to prevent blow-over. One person can re-stand a tree up to 45 gallons in size. Trees larger than that take two people. Labor costs, including workman’s compensation insurance and other benefits average about $8.50 per hour per person. If one person can re-stand about 90 30-gallon trees per hour, then that costs about 10 cents per tree. 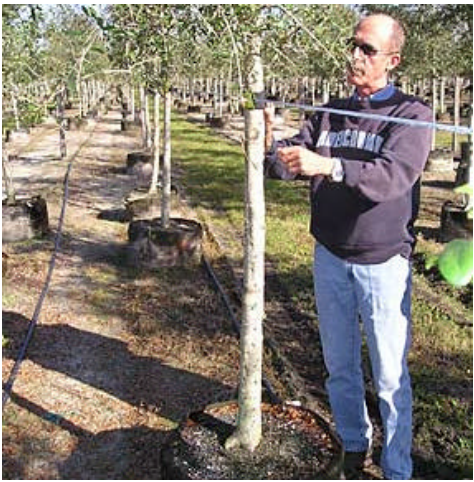 Slow release fertilizer has to be reapplied, which costs about $1 per tree, so the total cost to reposition a blown-over 30-gallon tree (which has a selling price of about $90) is $1.10. q You can assume trees will be blown over 10 times a year, but this amount is probably on the conservative side. But given 10 times a year, the cost to reposition one tree per year is $11, or $55 per tree over a 5-year period. The post-and-cable system pays for itself in the first year it’s installed. This example doesn’t even take into account trees that become nonsalable resulting from damage incurred during blow-over. If only five trees (at $90 per tree) are lost per year due to blowover, then it cost a grower an additional $450 per year. Scarring the tree trunk is another hidden cost. Even light trunk scarring will devalue the plant by 20 percent. With proper use, the tree collar has padding to virtually eliminate this problem. Previously, with hose and wire wrapped around the tree, trunk scarring was a frequent problem, and a great many $90 plants were sold for $72. Also consider that the time employees take standing up trees is time they could be doing something else. There are the costs associated with workers doing nonproductive work, while other duties are neglected.